Scientific journal "Chemistry, technology and application of substances " comes out twice a year starting from 2018. 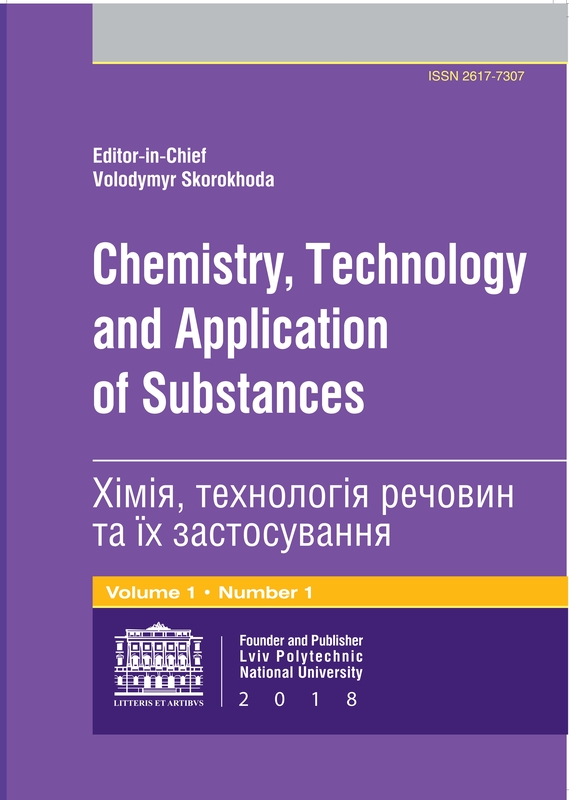 The journal is the successor of the journal “Bulletin of the National University "Lviv Polytechnic" series: "Chemistry, technology of substances and their applications" http://science.lpnu.ua/schmt. The Journal is on the list of scientific professional editions of Ukraine (chemical and technical sciences, since 2015). Amendments to the List of scientific professional editions of Ukraine were made in accordance with the order of the Ministry of Education and Science of Ukraine dated 18.12.2018 ı 1412. Language of publications: Ukrainian, English. The scientific journal "Chemistry, technology of substances and their applications" aims to publish the completed research results in the field of chemistry and chemical technologies. The journal is an information platform for the exchange of scientific ideas and practical research results. The journal provides coverage of the problem issues of modern scientific research in the fields of analytical, inorganic, physical, organic chemistry, chemical technology of silicates, technology of organic products, technology of oil and gas, biotechnology and ecology. The questions of the synthesis of new substances, the study of kinetics, reaction mechanisms, the production of biosynthesis products, the study of microorganisms' cultivation regimes, methods for their selection, as well as the problems of improving and intensifying the technologies of obtaining new macromolecular compounds, silicate materials are considered. The editorial board of the journal "Chemistry, technology and application of substances " is guided by the international ethics of scientific publications and is pursuing an open-access policy. All articles submitted to the editorial board are obligatory reviewed and verifiable for plagiarism.